They called him the "dungeon master." The "game designer." The kid who would print and laminate his own game cards for the games he would design on his own time. When his friends from the homeschool program would meet him at the park, they'd leap out of their cars and him to ask what game they were playing that day. Today, you can just call Hamish Seymour one of the youngest players to ever play on the Pro Tour. The Sydney, Australia, native was first introduced to Magic five years ago when he was just ten years old; there are Modern-legal cards older and Mirrodin was the current set when he was born. A friend suggested the game and Seymour's older brother had heard of it, so they decided to give it a shot. "I played for about a minute before I decided that this is what I would be doing from now on," he explained with a laugh. "The first card I ever saw in my first [game] that I really liked was Spread the Sickness. I loved what it could do." At ten years old, Seymour was hooked. Soon his home-printed game cards were joined by Theros spells. Adventures with friends included Planeswalkers. Trips to the park were chances to test new brews and cast newly acquired spells. His mom, Anne, was there for it all. At first, she assumed Magic would be another in Seymour's running string of gaming escapades that her creative son enjoyed sinking time into. When he first asked for more cards, she demurred, suggesting that he continue to play with friends' cards for the time being. After all, ten-year-olds aren't exactly known for their patience and attention span. But Seymour kept on, and it wasn't too much longer before he had the whole family of five slinging spells around the kitchen table and buying loose booster packs to bolster his collection. For his birthday, Seymour's parents threw a Magic zombie-themed party, complete with scavenger hunts that led to hidden packs. The dungeon master's time was now spent designing not just games, but deck after deck after deck. It didn't take long for Seymour to realize how much Magic meant to him. But what he didn't know yet is just how much the community would mean to him. But when his best cards were stolen one day at the park, he quickly found out. His mom called the closest game store to inquire about replacing the lost cards, and his two brothers, Joshua and Liam, pitched in to buy him a booster box, which he went to pick up with his mom. What he found at the store shocked him. "The girl working at the shop had contacted another shop, and when we got there they had worked together to get all the cards that had been stolen and they just gave them to him when we got there," she beamed. "That was just such a nice thing to do. The people in this community have been amazing. Even though he's so young they just treated him like another player." If Seymour wasn't hooked before, he was forever a Magic player after that moment. He began to play at his local store, and any longtime player knows what comes next—he started playing regularly at Friday Night Magic and soon began to compete in the larger Competitive Gaming system, battling in PPTQs and even Grand Prix. The family packed up and drove 10 hours to play in Grand Prix Sydney, where coverage member Ray Walkinshaw caught up with Seymour when he was just twelve years old. Seymour had a natural talent for the game and began to up his game. His free days were spent playing Magic and consuming all the online content he could find, while his nights were filled with untested deck ideas floating around his head as he lay down for bed. The TVs stayed tuned to Twitch for Magic event coverage as he watched his heroes and hopefully—one day, at least—peers. Even Anne found herself waking up early in the morning and turning on Magic coverage while her son was still asleep. One of those they saw or read about regularly was Quinn Kiefer, whose family had been living what Anne described as "parallel lives" on the other side of the globe. Along with his two older brothers, Quinn—just a few months younger than Hamish—had been grinding the tournament circuit, working his way up to Grand Prix and eventually the Pro Tour at the age of fifteen. The Quinn brothers may not have known it at the time, but they were inspiring another kid across the world. Seeing their success spurred Seymour to redouble his efforts, despite the relative lack of high-level tournaments in Australia. Many players spend years trying to qualify for the Pro Tour. Some never make it. But the fifteen-year-old turned the same determined drive that led him to create his own games toward qualifying for the Pro Tour. He played every tournament he could—including a team Grand Prix that at times saw him basically playing two games at once—and within a few months he took down a PPTQ, followed in quick order by winning the Regional Pro Tour Qualifier, guaranteeing himself a spot at Pro Tour Guilds of Ravnica and fulfilling a dream he had spent nearly half his young life chasing. After two weeks in the States, his idols are no longer just names on a Top 8 decklist. 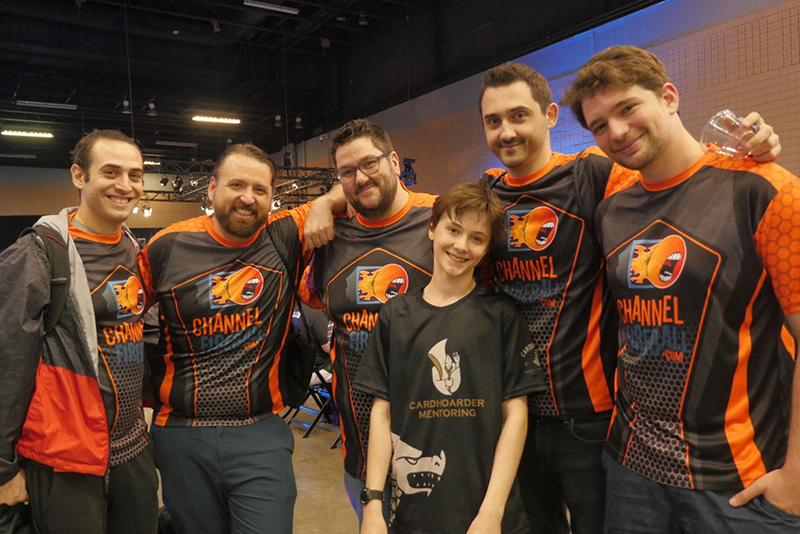 He's met all his heroes, from his favorite player, Reid Duke, to all the pros on the ChannelFireball squad. He's gotten mentoring from pros Thiago Saporito and Thiago Rodrigues. He played against Hall of Famer Frank Karsten. He drafted next to Paulo Vitor Damo da Rosa. Thanks to Magic, he's lived an experience most fifteen-year-olds could never imagine, much less accomplish. "It's been absolutely great," he gushed even after falling out of Day Two contention. "It's been an amazing experience, and I can't wait to get back here." But he hasn't been alone. Anne has been there through it all, from the wonder of those first games to the heartbreak of the stolen collection, to the joy of qualifying for the Pro Tour. Through the highest of highs and the lowest of lows, she's watched every game and ridden the rollercoaster right next to her youngest son. 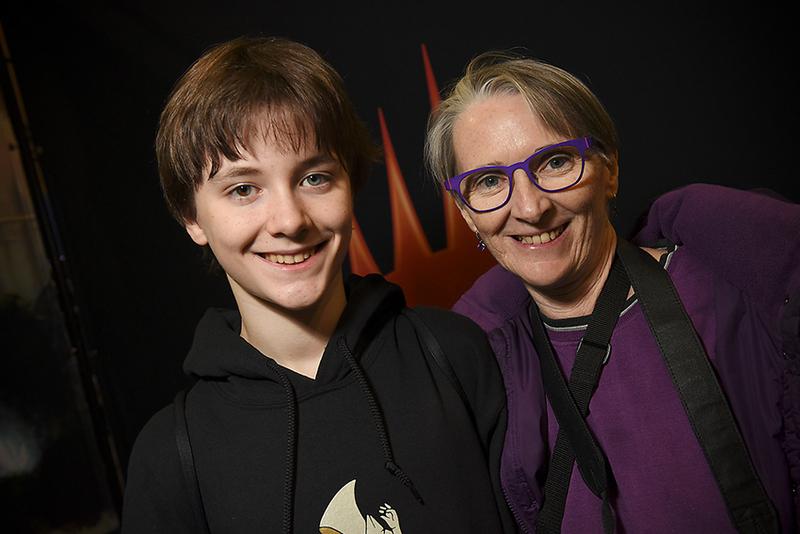 "I think more parents should support their kids playing Magic," she said. "It's an incredible educational opportunity. He gets to hang around a bunch of really smart adults who have embraced him, and it's really good for a kid's social skills. "He's living his dream, and I get to be here with him while he does." What's next for Hamish after the Pro Tour? As you might expect from the dungeon master and game designer, he wants to one day work in Wizards of the Coast R&D. But until then? Well, he gets back to Sydney from the Pro Tour next Thursday. Grand Prix Melbourne starts on November 16 and is "only" a 10-hour drive away. The entire Seymour family will be there.